You have to admit, R2-D2 was pretty adaptable to toys-- there are just so many uses that stumpy, cylindrical body can be put to. 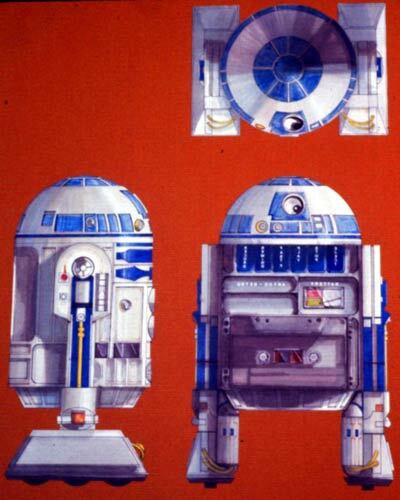 On this page are showcased three conceptual paintings, which Kenner used to sketch out ideas for R2-D2 related products. These all probably date from the late '70s; in fact, it wouldn't surprise me if they were all parts of the same process of conceptualization. 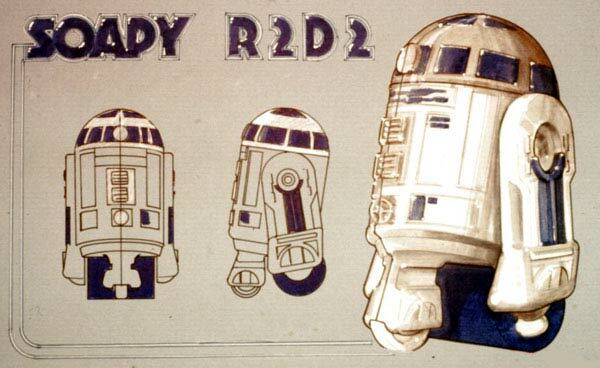 Just imagine some Kenner designers sitting around and thinking "Now, what can we make out of R2-D2?" First up is a series of ideas for R2 clocks. Most of them have the clock face positioned in the "body" portion of the droid. But one face is actually plastered over the dome "head." I have to say, I don't think that one's too successful. Most of the clock faces feature graphics drawn from the Star Wars film and the many promotional photographs that accompanied it. One shows Han Solo and Chewbacca, another a stormtrooper inside a corridor of the Death Star, and still another a dog fight bewteen an X-Wing and TIE Fighter. 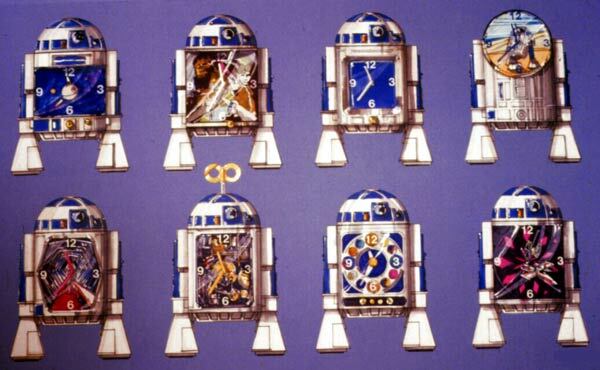 But Kenner never made an R2-D2 clock during their experience with the Star Wars license. Next up is an R2-D2 tape deck. It's pretty self-explanatory-- insert the tape into the droid's body, press "play" and listen to Styx, R.E.O. Speedwagon or whoever else is your horrible '70s band of choice. I think this idea is pretty clever. But, as with the clocks, Kenner never brought it to production. Lastly (and most oddly) is what might be the greatest product idea that Kenner considered but ulimately never released. Speaking personally, I can say that, as a child, I always felt an incredible desire to own a Star Wars bath aid-- something that I could not only play with but scrub myself with as well. Yes, it's the Soapy R2-D2! What we, as Star Wars obsessed kids, were always lacking from our shallow lives. To be honest, I'm not sure what this is; I'm just assuming you were supposed to use it in the bath. See that seam that runs down the center of R2's body? My guess is that one was supposed to open the droid up and place a bar of soap inside of it. Either that or it was intended to be filled with liquid soap. Then you could roll it over your body, the back wheel (which looks like it could be spongey) soaping up your grimy body. Weird, huh? Unfortunately, two of the items seen in these photos are not known to currently be in existence. The piece depicting the clocks, however, is now owned by Archive contributors Lisa Stevens and Vic Wertz. These images come from a batch of slides unearthed by Chris Fawcett, web master of 12back.com.